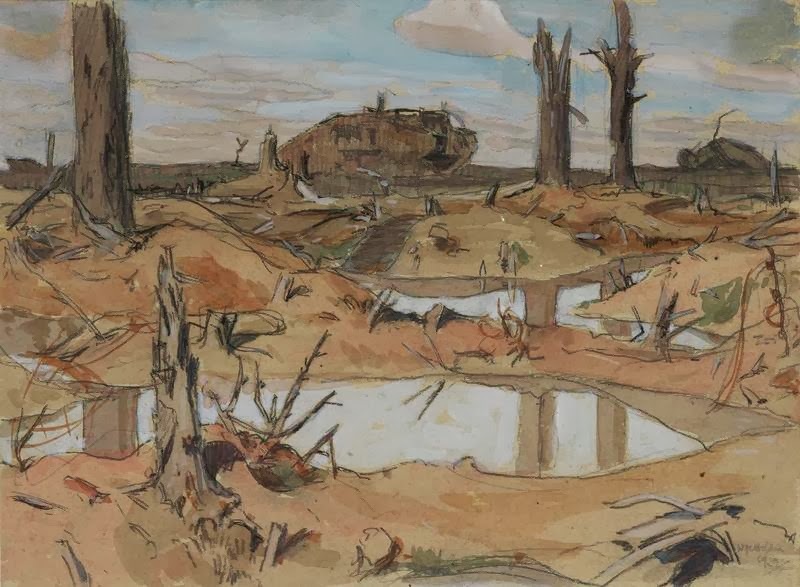 In war paintings we think of the horrendous loss of life first and foremost. As it should be. 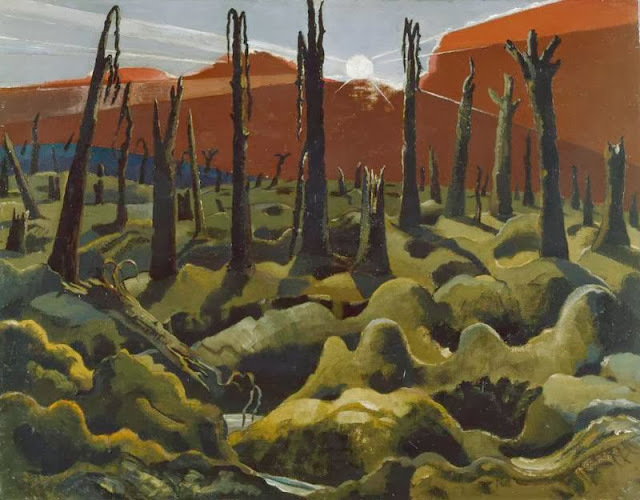 However as a distinguished landscape painter Nash knew that the landscape destroyed was the work of over a thousand years of the labour of mankind in tilling a wild landscape to agricultural purposes.
" On every side the dread phantom of war holds sway: there is scarce room for another thought in the minds of men. The combatants are the greatest and wealthiest nations of the earth; what wonder, then, if, well provided with the most awful weapons modern military science has devised, they strive to destroy one another with refinements of horror. There is no limit to the measure of ruin and of slaughter; day by day the earth is drenched with newly-shed blood, and is covered with the bodies of the wounded and of the slain. Who would imagine as we see them thus filled with hatred of one another, that they are all of one common stock, all of the same nature, all members of the same human society? Who would recognize brothers, whose Father is in Heaven? Yet, while with numberless troops the furious battle is engaged, the sad cohorts of war, sorrow and distress swoop down upon every city and every home; day by day the mighty number of widows and orphans increases, and with the interruption of communications, trade is at a standstill; agriculture is abandoned; the arts are reduced to inactivity; the wealthy are in difficulties; the poor are reduced to abject misery; all are in distress."